Wow. September went by in a flash, didn’t it? By the looks of the social calendar we think the same goes for October. There are so many exciting and fun things happening in Abu Dhabi during the month of October. Whilst we could not possibly include ALL, here are a few of the events that are on our radar for the month of October. October 1: Bon Jovi is kicking off the Abu Dhabi concert season. If you haven’t booked your tickets yet, start checking Abu Dhabi Market Place on Facebook (always last minute deals to be had). Or you can purchase from Ticketmaster.com. 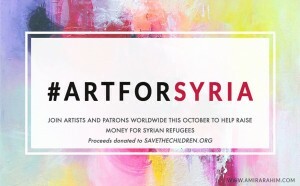 October 2: #ArtforSyria – Abu Dhabi based artist Amira Rahim has put together this project which will feature pieces by herself and other regional artists. All money raised by this effort will be going to Savethechildren.org. If you have been looking to purchase original art, this is the perfect opportunity. The sale goes live on Monday October 5th but you will want to sign up beforehand so that you don’t miss out. If you would like to be the first to know when a piece goes on sale or you are an artist that would be interested in participating – check out the link here. October 3: Ripe Market – Happening EVERY SATURDAY at the Collection 10:00 – 2:00 pm. If you really need a reason to head down to Saadiyat on a Saturday, this is the perfect reason. Grab your weekly organic veggies plus take a stroll through the market and check out the local vendors. October 4: Laughter Yoga – We have never been to this but we are definately going to give it a try this month. Kathryn Armstrong leads a group of people in a session of laughter and yoga. Happening at La Rosy Beauty Spa and Fitness Center. For more details check out the event here. Opening night – Caravan Journey of Art. A collaborative effort from regional artists part of the Abu Dhabi Arts Collective. This event will continue throughout the month of October happening at the Space. Make time to stop by. For more information click here. October 5: Smile Cafe – Operation Smile Book Shop. This is actually open EVERY MONDAY from 10 – 4 pm. There is a large selection of books available. Don’t expect to walk in and out. You’ll need browsing time. Enjoy a cup of coffee and a cake. All proceeds go to Operation Smile. October 8: Dave Matthews Band. We purchased tickets back when they first went on sale back in February. Needless to say, we have been looking forward to this for a very long time now. October 12: Housewives Casual breakfast meet up at The Living Room Cafe. Come relax in the cozy atmosphere of The Living Room Cafe. Let us know that you will be there by having a look at the event on Facebook. October 16: ADCB Zayed Sport City Pink Run. Choose between either 5k or 10k distance this run around Zayed Sport City is always a fun family event in support of Breast Cancer Awareness. Register online at Premier Online. Hurry – places are filling fast. 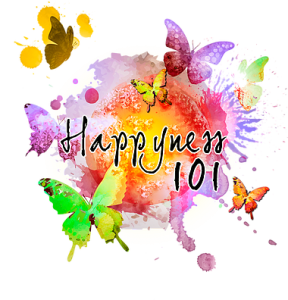 October 17: Happyness101 – Randa El Zein, Founder of Be You International will be hosting a workshop aimed at helping you find your happiness. Giving you the tools you need to find the happiness that is already inside of you. Spend the day with Randa and leave feeling empowered. This event will be taking place at Melius. To register: Happyness101. October 21: Her Hub – Speed Networking in the Sky. A new Ladies Only networking event happening at the super trendy Stratos Revolving Lounge and Bar. It looks very exciting and promises to be a great event. Cost: 130 AED. October 22: Make a Difference Day – Happening at Beach Rotana. A Family Fun day to raise money for Red Crescent Abu Dhabi. We have all the details for your here. Happening from 2:30 – 7:30 pm tickets are only 30 AED per person. October 23: Paddle In Pink – In support of Pink Caravan, head out into the mangroves for a guided kayaking trip. Wear something outrageous as there are prizes to be won. In it’s 3rd year, the Paddle in Pink is brought to you by Eastern Mangroves Hotel and Spa. For more information please check out the event on Facebook here. Cost is 160 AED, 130 AED for children. Desert Warrior Challenge – Okay. It is not happening in Abu Dhabi but only a short drive away. We did the course at Yas Marina last Spring and it was so much fun. They say your inner warrior comes out but more like your inner child. Climb, run, get dirty through either a 5k or 10k course. Don’t be too intimidated to give this one a go. (There is always someone around to help you). For more information and to purchase tickets please check out Desert Warrior Challenge here. 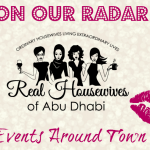 October 27: Real Housewives Monthly Meetup featuring author Laurie Nelson. This is going to be a morning you will not want to miss. Block it out now!!!! October 29: Neo Run – Kicking off the Halloween weekend, this night run will be frightfully fun. Come ready to run in your scariest costume and be ready to glo. To register please check out The Neo Run – Halloween Run here. October 31: La Loupe Halloween Outdoor Market at Eastern Mangroves. Bring your children down dressed in their Halloween costume for an evening of Trick or Treating whilst you get a jump on your holiday shopping. Event timing 3:00 – 9:00pm. La Loupe always brings in the best vendors from all over the region (not just Abu Dhabi). This is one you won’t want to miss.